The Stage House Inn was along the New York-Pennsylvania Swift Sure Stage Line in the late 1700s. Scotch Plains, New Jersey, is by no means a bustling party town. 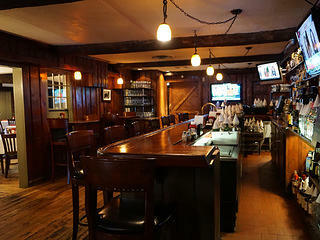 But try grabbing a drink on a warm summer night at the Stage House Tavern, and the crowds might convince you otherwise. 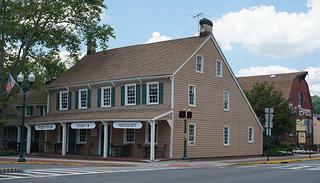 Opened in 1737 by John Sutton as the Stage House Inn, the tavern served the community as a meeting place for local government and became a central location during the Revolutionary War for patriot conscription. Operated by over two dozen inn keepers in the 18th and 19th century, the Stage House has continued to serve customers and the Scotch Plains community for nearly 280 years. 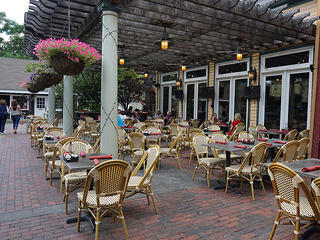 In the 1990s, the restaurant went on to become one of the best fine-dining restaurants in New Jersey. Purchased in 2003, the Stage House was transformed into a hotspot for quality tavern fare and fun nightlife—while maintaining its historic charm. Owner Tom Britt names the Stoli Surprise as a popular cocktail. Equidistant from Manhattan and the northernmost beaches of the Jersey Shore, the town of Scotch Plains stretches across the mountains of the Watchung Reservation and is the quiet home to many suburban families. Originally inhabited by the Lenni Lenape tribe, the region was resettled by colonial explorers in the 17th century. Scotch Plains eventually became a setting for the Revolutionary War and battleground during the Battle of Short Hills in June 1777. A plaque outside the structure memorializes the 1789 innkeeper, Col. Recompense Stanberry, who organized a troop of soldiers, the Jersey Blues, just outside the inn. He is buried across the street at the Scotch Plains Baptist Church Cemetery. The National Register-listed site is made up of various adjoining structures, including an 18th-century barn that was reconstructed next to the original inn in the 1960s and opened as the Tavern in 2005. The oldest section of the structure is believed to have been constructed as early as 1684. 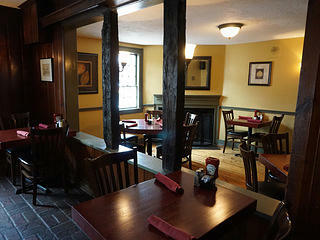 Structural beams and an old fireplace cast with the date 1737 have also been preserved. With bars in the original structure and the connecting barn, as well as a stone-topped outdoor bar, the Stage House offers drinking locations with historic ambiance and the opportunity to sip a cold beer under the stars. There is live music on the outdoor patio every Wednesday in the summer months—weather permitting—and bands play on the barn stage every Friday and Saturday night. For an even more exciting evening, diners are treated to a tableside magic show every Thursday night. Hours: Kitchen Hours: Monday-Thursday 11:30 a.m.-10 p.m.; Friday and Saturday 11:30 a.m.-11 p.m.; Sunday 11:30 a.m.-9 p.m. Bar Hours: Last call Friday and Saturday at 1 a.m.; Last call Sunday-Thursday at midnight. You’re having: Mark your calendar for Tini-Tuesdays—any martini or specialty cocktail for just $5. Best Yelp review: “If you want American bar food, with a little creativity—this is the place. I'm never disappointed and the burgers are the best!!!! Have a couple of pints and enjoy the local fare!” –Chris C.
The outdoor patio can get packed during summer evenings.